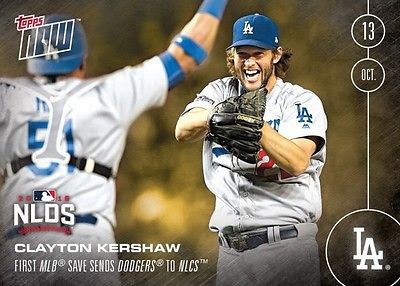 In addition to the postseason 15-card Dodger team set currently available (originally written about here), Topps Now has just release two more cards to add to their running set. Both cards capture the excitement and joy of yesterdays big day. Unfortunately, Vin Scully isn't featured on either. 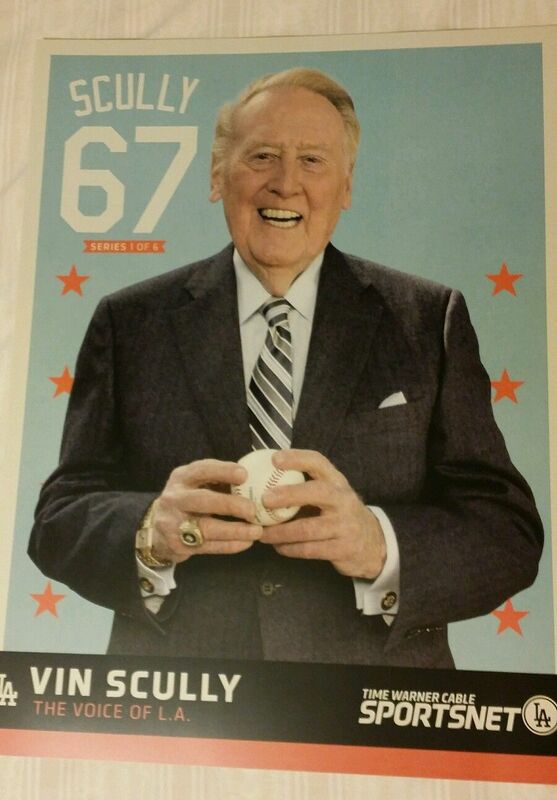 I thought I would finally take some time to officially catalog a Vin Scully collectible that has been available all season at Dodger Stadium this year. 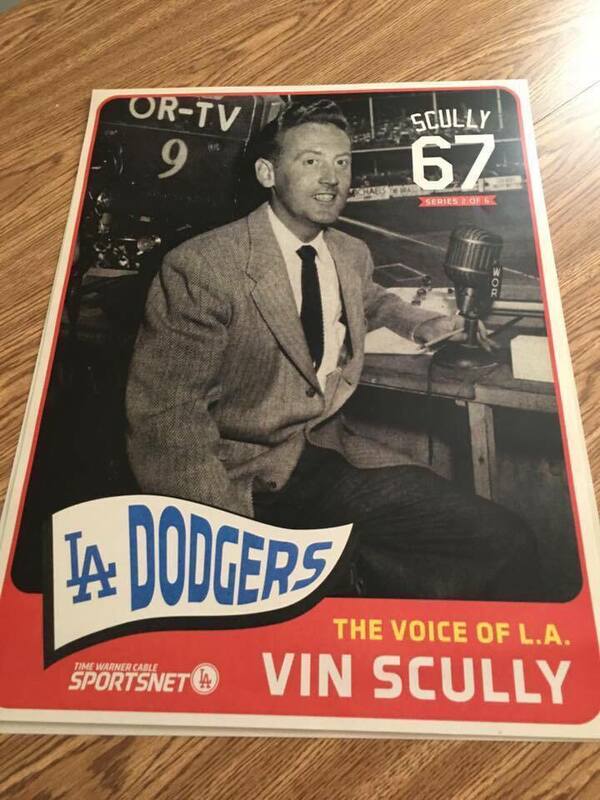 As you may know, SportsNet LA has been passing out special commemorate posters to fans for free that features Vin Scully, and if you haven't seen them before then you can now get a look at them all below. They measure 18"x24". Click on any pic to embiggen. They all borrow designs from vintage Topps Baseball cards. The posters have been selling briskly on eBay for a wide range of values -- from as low as $10 to as high as $60 a piece. Frankly, these values seems way too high. I suspect that the emotion of his upcoming retirement has pushed values to those levels. Given enough time I think prices should fall to more reasonable prices. On the other hand, I could be entirely wrong. There is an significant lack of memorabilia featuring Vin Scully for fans to chase after, so we could be seeing a new normal for Scully collectibles. 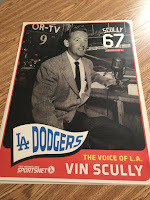 BTW, three years ago I put together a listing of all the various Vin Scully cards and other cardboard-styled collectibles that I was aware of. You can check that out here. Also, I am planning on putting up a new post featuring the various memorabilia items that exist; including the various stadium giveaways and magazine covers. 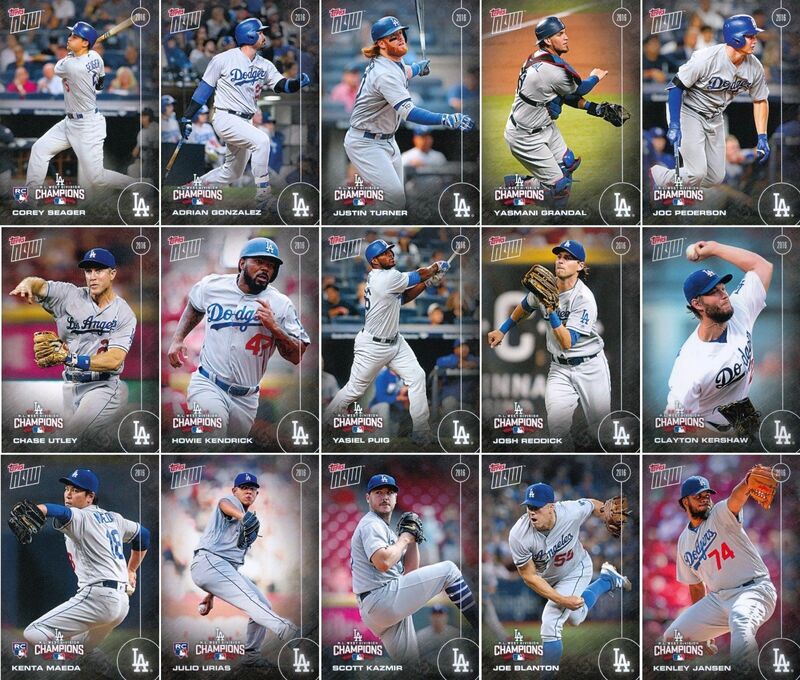 In honor of the Dodgers recent western division championship Topps has issued a limited edition 15-card postseason team set. It is available for order until Thursday, October 6th at $49.99, and is limited in number based upon the number of orders received during that time period. Go here to check it out and order. At the very bottom is a checklist. A special catch to the set is that the size will expand depending on how far they get in the playoffs. 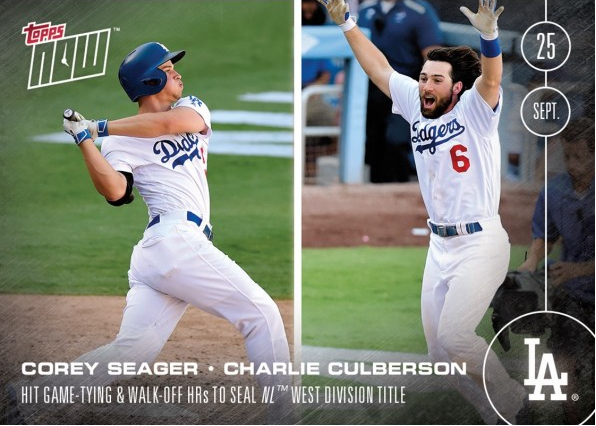 Each set will receive one extra exclusive bonus card for each playoff series they win. Hopefully, we'll see three more cards added to this set. 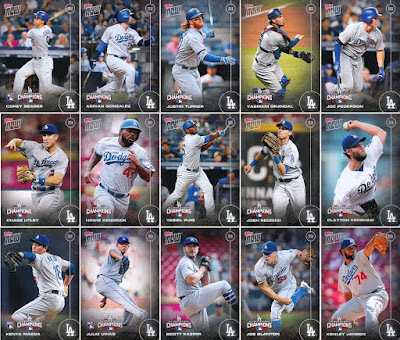 UPDATE: The print run for this set of Dodgers cards is 383. 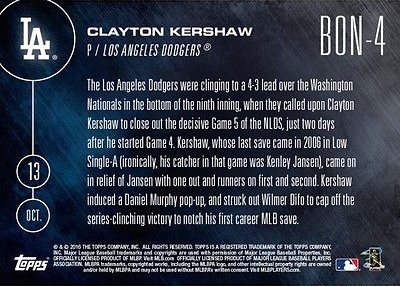 UPDATE II: Below are pics of all the cards in this set; including the one bonuc card featuring Clayton Kershaw. The bonus card is numbered BON-4. 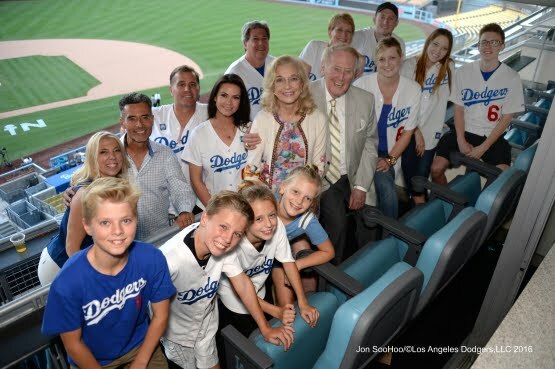 Here are various links and stories related to Vin Scully Weekend. 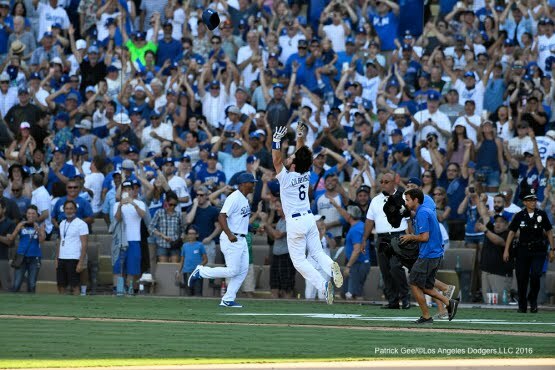 As you can imagine it would be impossible to link to them all; nevertheless, I hope this allows us all to relive the most dramatic, if not most emotional Dodger weekend over the past twenty years. The photo above via Jon SooHoo/LA Dodgers 2016. Go here to check out a bunch of great pics from yesterdays event from Jon, Jill Weisleder and Patrick Gee. 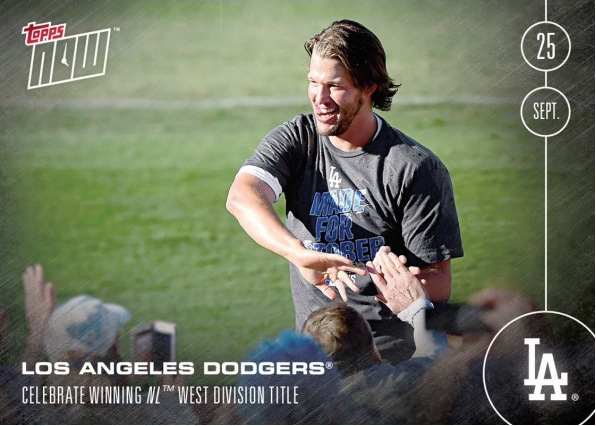 Blog Kiosk: 9/26/2016 - Dodgers Links - Division Champions! The Dodgers sure do have a flare for the dramatic. On an afternoon that would mark Vin Scully's last home broadcast and Fan Appreciation Day the Dodgers did the unthinkable. 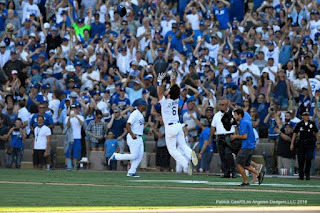 Not only did they capture their fourth straight National League Division Championship, a first in franchise history, they also did it with a 10th inning walk-off home run by a journeyman infielder. In some ways, the way in which the team took the title yesterday is reminiscent of who this team is. They are a group of men all moving together in the right direction. Some of them are superstars, while others are the gritty pieces necessary to last an entire 162-game schedule, but they all know that they need to play their part in order to take home the grandest prize in the league. Considering how tough it is for a team to compete when experiencing a high number of injuries like the Dodgers have had, it should shock the system that the team has gotten this far. By rights, this season should have been a wash. We should not be where we are. Alas, though, here we are. 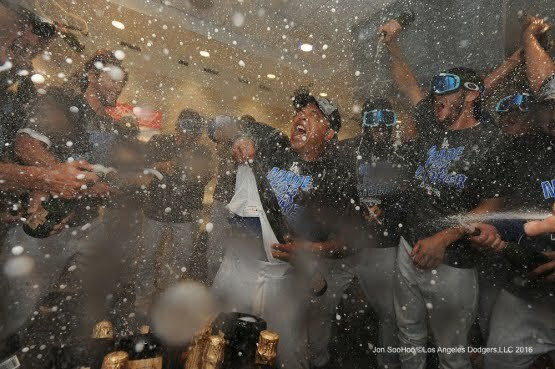 The Dodgers are the Western Division Champions, and I couldn't be more elated. This Day in Dodgers History: In 1908 Cubs right-hander Ed Reulbach pitches two shutouts on the same day against the Brooklyn Superbas (Dodgers), 5-0, 3-0. The entire doubleheader is played in under three hours. In 1981 Nolan Ryan of the Astros no-hit the Dodgers at the Astrodome, 5-0. In 1988 the Dodgers clinched the NL Western Division title in their 3-2 victory over the Padres. As you surely know, they would go on to win the World Series several weeks later.